Are you being treated for hypothyroidism, but are still experiencing many of its symptoms? Often patients will complain that they still have fatigue, weight gain, brain fog, depression, constipation, and cold hands and feet, even though they have been placed on a thyroid medication by their doctor. Research shows that patients on T4 alone scored worse on surveys relating to general well-being and symptoms of hypothyroidism. (2, 3) This is a very common occurrence, and here are two reasons why. 2. Incorrect or Insufficient Dosage: Second, you may not be on the appropriate dose of thyroid medication. It is very important that your doctor listens to your symptoms, and does not adjust your dose based solely on your blood work. If you are still having hypothyroid symptoms, then you may need to increase your dosage, however please only do so under the care of your provider. At Hotze Health & Wellness Center, we have great results treating hypothyroidism with bioidentical compounded T3/ T4, which includes both the inactive thyroid hormone, thyroxine (T4), as well as the active thyroid hormone, triiodothyronine (T3). If you are one of those people who are frustrated with their thyroid treatment, there is a solution! You can get rid of these symptoms once and for all. Contact a wellness consultant today to schedule a complimentary wellness consultation at 281-698-8698. 1. Stability Effectiveness Desiccated Thyroid VS Levothyroxine John C Lowe Thyroid 2009 Lowe, John C. “Stability, Effectiveness, and Safety of Desiccated Thyroid vs Levothyroxine: A Rebuttal to the British Thyroid Association.” Thyroid 4.3 (2009): C1-12. Please tell me how I can rid myself of all the symptoms of my hypothyroid! I’m taking synthroid but not much has changed. This is a very common occurrence for people who take Synthroid. 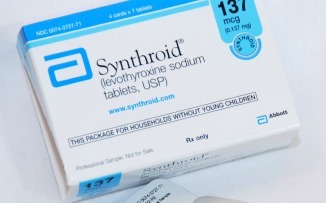 Synthroid is a synthetic thyroid preparation. It contains T4, which is the inactive thyroid hormone. Your cells must be able to convert T4 to T3, the active form of thyroid hormone, in order to produce energy and resolve your symptoms. For this reason, many people still experience all the symptoms of hypothyroidism even though they are taking this medication. Our doctors recommend using a desiccated thyroid preparation, which is bioidentical to the thyroid hormones made by your body. It contains both T3 and T4, along with nutrients from the thyroid gland. We see marked improvements in our patients and resolution of their symptoms on desiccated thyroid. We will be happy to help you. Please call a wellness consultant for a complimentary consultation at 281-698-8698. We hope you are able to enjoy good health again very soon! I have been on Thyroid medication for over 40 years. I have very dry skin, dry hair, memory problems, am cold when other people are comfortable, cannot lose weight, etc. I have been on Armour Thyroid medication and am now on Levothyroxin and I really cannot tell the difference. My doctor doesn’t like Armour because she says she doesn’t feel comfortable with dosage, she cannot know if it is correct. Any advice for me. I would love to have more energy and mental acuteness. Many mainstream doctors do not know how to properly dose desiccated thyroid preparations such as Armour Thyroid. Please don’t lose hope, once you get the proper help you can get rid of your symptoms. Our doctors also look at your adrenal health, which could factor into this. If your adrenals aren’t functionally optimally, that will affect your thyroid function, as well. If we may be of service to you, please contact our Wellness Consultants for a complimentary consultation at 281-698-8698, or send us your contact information and we will be happy to have a Wellness Consultant contact you. This describes my experience. I was on synthroid but still had all the symptoms of hypothyroid except for weight but I was also dealing with infertility. My TSH was “correct” so my previous doctor wouldn’t switch me or change the dose. I switched to a naturapath who switched to nature-thyroid and told me to go gluten free, got pregnant 3 weeks later after trying for 2 years and being told we needed IVF. I believe it was the combination of the NDT and the gluten free diet that did it. I was on synthetic thyroid medicine for over 20yrs. I really had no truly noticeable change in bouts of extreme fatigue, constipation, or brain fog. I read an article about using natural thyroid medicine such as Armour Thyroid would help. I was prescribed this during the first year after diagnosis. Two years ago I demanded that my doctor prescribed Armour Thyroid. He gave me every excuse in the world not to switch. He even told me he would have to monitor my thyroid hormones more closely. I asked him shouldn’t he be found that anyway? He said nothing and wrote my prescriptions. The constant extreme fatigue is gone. I may have a bout of fatigue 3 times a year now compared to weekly. Get Dr. Hotze’ books!!! They explain so much of the illnesses I have faced in my life. Thank you for sharing your story! That is wonderful news that your extreme fatigue is gone. We have great results in treating our patients with desiccated thyroid, as well. It can make all the difference to switch from Synthroid to desiccated thyroid. We wish you continued good health! I was diagnosed with Hypothyroidism after I had my daughter 15 years ago. Since then my Thyroxine levels have been all over the place along with my dosage which is now at 100mcg daily and I also take cortisone 12.5 daily as my pituitary gland collapsed which knocked out my adrenals etc. I live in Australia and I was wondering what you would suggest for me. I am always tired, weight gain, heat intolerance, fever, sweating. Doctor just takes bloods every 3+ months to see how my thyroid is going. If you are taking synthetic T4, which is the inactive thyroid hormone, then we recommend asking your doctor to switch you to desiccated thyroid, which has T4 and the active thyroid hormone, T3. our doctors have had great success in treating our patients with desiccated thyroid. The bottom line is that if you are still experiencing symptoms, then you are not yet on the right dose of thyroid hormone for your body. If your doctor is monitoring your thyroid solely by a single blood test, then that is not helping you either. The lab range for the TSH test is so wide that most patients fall within the “normal” range. What is normal for you may be different that what is normal for another person. This lab test often fails the patient. Our doctors evaluate thyroid based on symptoms, clinical history, and basal body temperature. The bottom line is that if you are still experiencing symptoms, then you are not on the right dose for your body’s needs. If we may be of service to you, please contact our Wellness Consultants for a complimentary consultation. We see patients from all over the world, and you only need to come here in person for your first visit with the doctor which is very comprehensive. All follow up visits may be done over the phone. We wish you great health!